Mechanical Dynamics and Analysis inspected and repaired an A-10 frame High Pressure rotor. The unit was a 3600 rpm, 90 MW combined cycle unit. 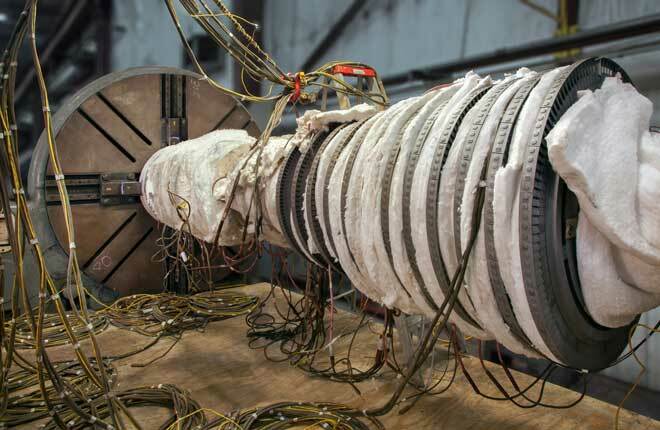 MD&A’s Turbine-Generator Repair Facility performed the incoming inspections / evaluations, repair straightening of the rotor, final inspections, as well as high speed balance. Incoming inspections and evaluation consisted of blast cleaning, NDE, visual inspections, material verification, as well as a detailed runout check of the rotor. 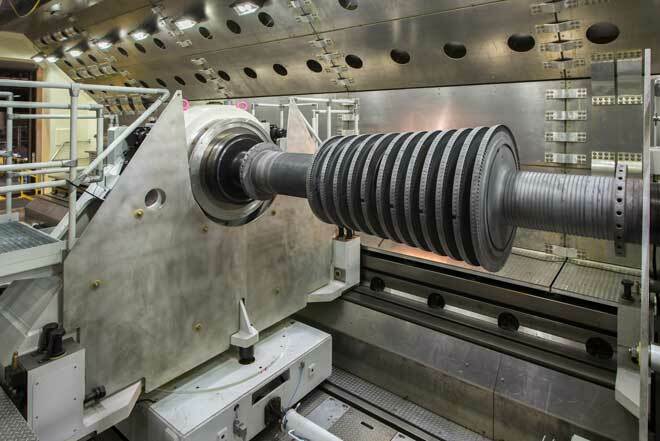 The rotor straightening involved an initial stress relief operation, as well as multiple iterations of thermal straightening, to correct the incoming rotor runout condition. In support of the rotor straightening, machining modifications were made to the shaft N-3 packing gland area as well as the inboard thrust collar. The N-3 packing gland area on the rotor was machined to a smaller diameter and new packing rings were supplied and installed. The backside of the inboard thrust collar was modified to add a much needed balance weight plane on the turbine end of the rotor. The thermal straightening process did not require machining of the rotor journals, re-sizing of the journal bearings, machining of the couplings, or line boring of the coupling holes on-site during reinstallation. After completion of all repairs, the High Pressure rotor was balanced at operating speed and overspeed tested at 110%. The High Pressure rotor was received with a bow of 0.040” TIR (total indicator reading) in the N-3 packing area of the rotor. This amount of runout would not allow the rotor to spin up through critical speeds, let alone get to rated speed without severe vibration. MD&A successfully straightened the HP rotor to 0.003” TIR using a thermal straightening process. 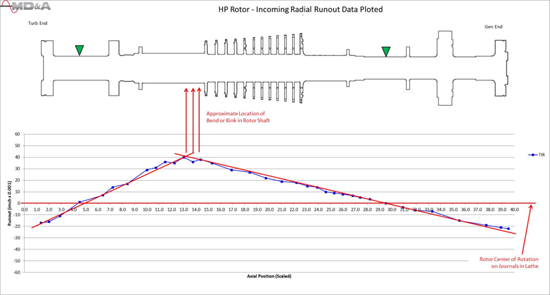 The HP rotor was balanced and overspeed tested without incident, and returned to site for reinstallation and startup.